We do not know, for example, what is the actual mental impression (color-wise or otherwise) in the mind of another human viewing the same scene as we do. And we cannot directly measure the color sensation. And thus we cannot quantify (describe in numbers) the color sensation evoked by a certain kind of light. The best we can do is speak in terms of vague, qualitative properties. As a consequence, we say that such a beam of light has a certain color, by which we of course mean that it is expected to evoke a certain color sensation in the human visual system. Thus, "color" as a "thing" indeed refers to a sensation in a human observer, but the scientifically quantifiable property color pertains to light. The part of the human retina with which we are concerned here comprises numerous cone receptors of three different types (for a human with "normal" color vision). The types have different spectral responses, the functions that describe how components of the light on the retina are "weighted" by wavelength to arrive at the cone's output value. As a consequence, the human color sensation is three-dimensional (in the mathematical, not geometric, sense). That means that if we could describe it numerically, we would need three numbers to describe any given sensation. But of course we can't describe the sensation numerically in any precise way. 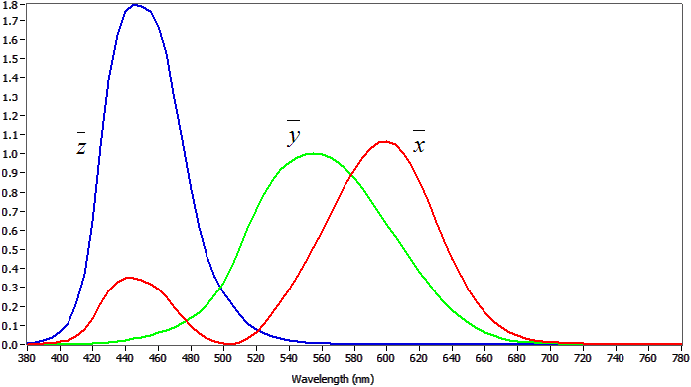 Thus it might seem that the color of a light beam (the property that determines what color sensation it is expected to evoke in a human observer) should also be able to be described, numerically, in a system of three values. And elbaorate tests by color scientists confirmed that conjecture. Then was thus a need for a standardized system of such three values to numerically describe the color of an instance of light. In 1931, the CIE (The International Commission on Illumination, the acronym coming from its French name) published such a system. In it, the color of an instance of light (and recall that color here includes the property of luminance, or "brightness") is described by a set of three values, represented by the symbols X, Y, and Z. Because a system of, n values can be visualized in terms of a plot in n-dimensional space, the values of the variables can be thought of as "coordinates" of a point in that space. Thus the three values X, Y, and Z are often spoken of as the coordinates of a certain color. In any case, light whose color is describable by certain values of X, Y, and Z is expected to evoke a consistent color sensation among human viewers. The color of an instance of light (meaning, the color sensation it is expected to evoke in a human observer) is determined by the spectrum of the light. It turns out that, for the light to have any given color (that is, for us to expect it to evoke a certain color sensation in a human) it can have any of an infinity of spectrums. This situation is called metamerism. So we can (at the very least) imagine that light of two particular spectrums will evoke the same color sensation in human viewers. This is the time to mention that, even for humans having "normal" visual systems, the responses to light with different spectrums may differ slightly. Thus light with spectrum A and light with spectrum B might appear identical to Alice, but not quite identical to to Bob. Thus, all the scientific work I speak of, and the standards for describing the color of light, bear the concept of "for an average human viewer". The tests that established the premises for various measurements all involved large cadres of subjects. • By the color of of a certain instance of light, we mean the property by which it is expected to evoke a certain color perception in a, "average" human observer. • The color of an instance of light is determined by its "spectrum". • Many different spectrums can result in the light having any given color. • We need only use three numerical values to completely specify the color of an instance of light. 1. We determine, with a spectrometer or similar instrument, the power spectral density function (PSD) ("spectrum") of the light of interest. 2. We multiply that spectrum curve by another curve (also a function of wavelength) that has a fixed definition (given by the CIE). It is called the "X matching function" curve. By "multiply by" I mean that at every wavelength in the visual range, we multiply the value of the light's PSD at that wavelength by the value of the matching curve at that wavelength, and plot that result for that wavelength on a third curve. 3. We integrate this third curve (essentially, take the area under it). That gives us coordinate value X. 4. We do the same thing as in steps 2 and 3 but with a different matching curve, the "Y matching function" curve. The result is coordinate value Y. 5. We do the same thing as in steps 2 and 3 but with a third matching curve, the "Z matching function" curve. The result is coordinate value Z. 6. The values of X, Y, and Z describe the color of the light under the CIE XYZ color system. They are identified with the usual formal notation, involving lower case "x", "y", and "z" with an overbar. Most commonly in normal practice, we separate out from the color description in terms of X, Y, and Z the luminance (which, through some clever work in the part of the CIE wonks, is in fact the value of coordinate "Y") and the chromaticity, which is expressed in terms of the coordinates "x" and "y" (how handy for plotting it!). This picture does not show the instrument set to display luminance and (in terms of x and y) chromaticity. This display does show the PSD, determined by the instrument as the first stage of its work. There are many more fascinating facts about the CIE XYZ color system, but they are beyond the scope of this note. That is not quite true and the answer lies in our genes and the way the human visual system functions. For some part of the human visual system, the function depends on many genes and, possibly, on external factors. Take for example the way humans see at night (an understudied feature of our vision system, but I digress...): our ability to increase sensitivity to light in the rods depends on the availability of rhodopsin, which is derived from vitamin A. Here, two humans will exhibit different ability depending on their diet (and plenty of other things). But human colour sensitivity depends on very few genes. Actually, out ability to discern colours depends on 3 pigments and each one is encoded on a single gene. The spectral sensitivity of a single cone cell directly depends on the type of molecule that cone uses as a pigment. In turn, each pigment is encoded on a single gene. Therefore, to have different spectral sensitivity one needs different genetics: mutation. As a consequence, if we consider non-mutant humans (and we must exclude mutations, because most mutations actually make humans more colour-blind), the maximal capacity of differentiating between colours is given by the pigments, which are fixed by genetics. Some people will have poorer abilities, because they are untrained or have poor vision, etc... but nobody can actually see more colours than the pigments can discern. All well said, and indeed I took the liberty of oversimplifying the topic. Thanks for adding a color picture! Do more. My brain needs beautiful color as well as the meat and gravy. 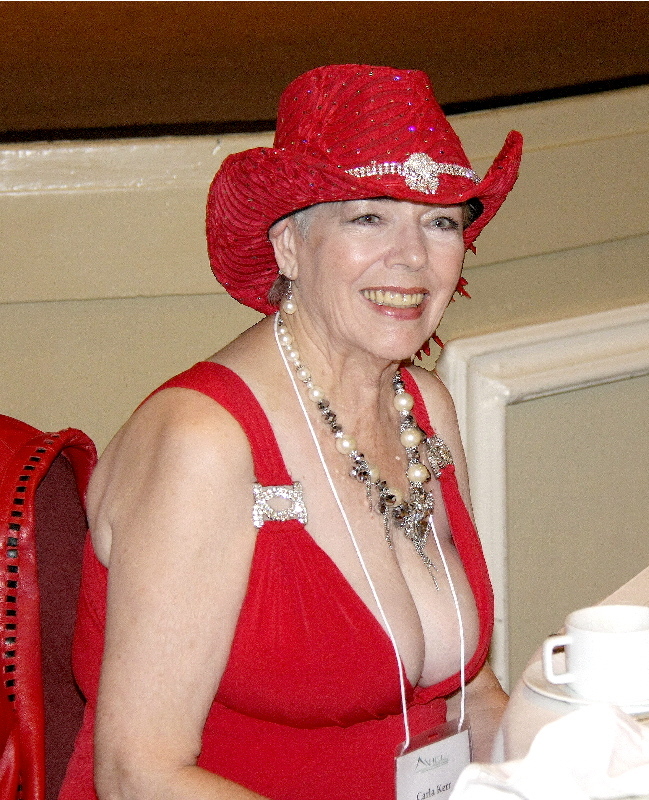 Carla is a wonderful start to any sit down meal! There's much to chew on here, Doug. I recently took up trying to paint with acrylics and the color wheel was a big part of the preliminary studies. It's remarkable how a thing seemingly so simple at first glance can quickly become something rather complex with use. Your essay is well-timed. There's much to chew on here, Doug. I recently took up trying to paint with acrylics and the color wheel was a big part of the preliminary studies. Carla is painting with acrylics on and off, but her studies haven't yet involved much "color theory". It's remarkable how a thing seemingly so simple at first glance can quickly become something rather complex with use. Your essay is well-timed. Best regards, and Merry Christmas. What are the vertical axis units in the P.S.D. function graphs? Eigengrau (German: "intrinsic gray", lit. "own gray"; pronounced [ˈʔaɪ̯gn̩ˌgʁaʊ̯]), also called Eigenlicht (Dutch and German: "own light"), dark light, or brain gray, is the uniform dark gray background that many people report seeing in the absence of light. The term Eigenlicht dates back to the nineteenth century, but has rarely been used in recent scientific publications. Nowadays, the phenomenon is more commonly referred to as "visual noise" or "background adaptation". Eigengrau is perceived as lighter than a black object in normal lighting conditions, because contrast is more important to the visual system than absolute brightness. For example, the night sky looks darker than eigengrau because of the contrast provided by the stars. Researchers noticed early on that the shape of intensity-sensitivity curves could be explained by assuming that an intrinsic source of noise in the retina produces random events indistinguishable from those triggered by real photons. Later experiments on rod cells of cane toads (Bufo marinus) showed that the frequency of these spontaneous events is strongly temperature-dependent, which implies that they are caused by the thermal isomerization of rhodopsin. In human rod cells, these events occur about once every 100 seconds on average, which, taking into account the number of rhodopsin molecules in a rod cell, implies that the half-life of a rhodopsin molecule is about 420 years. The indistinguishability of dark events from photon responses supports this explanation, because rhodopsin is at the input of the transduction chain. On the other hand, processes such as the spontaneous release of neurotransmitters cannot be completely ruled out. Well, I thought perhaps you would ask that. Actually, I don't just now know the unit in which that axis is usually labeled. (And I had wondered, briefly, about that as I fetched that illustrative graph.) And I will find out. But it is important in any case to first know the nature of that quantity. And important tip is that the full name of what is plotted is the power spectral density of the light of interest. And there is often a misunderstanding about the vertical scale of a density function. Let's first stipulate for the moment that the distribution of power in our light instance is continuous (that is, does not consist of emission only at discrete wavelengths). Now, it is tempting to say that, in the PSD curve for some "beam" of light we observe and measure, the value of the curve at, say, 450 nm (exactly) is the amount of power in the beam at that wavelength. But in a continuous distribution of power over some range of wavelengths, the amount of power at exactly any wavelength is zero. That may at first be startling, but we can be helped in grasping it by this analogy.We have a tapered steel rod about 250 mm long. I choose a location on the rod, say exactly 45 mm from the reference end. How much mass of steel is there in the rod at that location? Well, there is no steel "at that location". When we talk of a particular location, we mean a region of zero thickness. That is, when we say, "at exactly 45 mm from the reference end", we do not mean a region, for example, that extends from 44.99999 mm to 45.00001 mm. inches. We mean at (only) 45 mm. And a region of zero thickness along the rod contains zero steel. Now if we plotted that value for the entire length of the rod (it varies along the rod, since the rod is tapered). we would have the mass position density function of the rod. The dimensionality of the the vertical axis of that graph would be mass per unit distance. And presumably we would label it in the units g/mm. Thus the dimensionality of the vertical axis of a true PSD is power per unit wavelength. And the unit might well be watts/nm. And the total power in the "beam", given by the area under the curve, is in watts (works out well, as we multiply quantities in watts/nm by quantities in nm)! Now, if we take a certain instance of light and attenuate it by differing degrees, we would get different PSD's, the curve having the same shape but differing in vertical scale. And the areas under these curves would differ, because of course the total power in the beam would differ. Now in describing a standard illuminant, we do not wish to specify a certain total power, only a relative distribution (that is, the shape of its PSD) and so we arbitrarily scale the vertical direction of the graph. We can think of this as "normalizing" the graph. But to allow a meaningful (and intellectually satisfying) presentation, there is some convention that dictates how the vertical scale is labeled. For example, we might adopt the convention that the total power in a hypothetical instance of that illuminant is one watt. Then, having stated that, we could again label the vertical axis in the unit watts/nm. But that is clearly not the case here. So sadly, at this instant in time, I do not actually have the answer to your question. But I expect to have it shortly (perhaps after having been fueled by a decadent yet nourishing Breakfast B), and now we have the background to understand it! Which of course maybe you had already. Well, so far I find that the SPD for a given CIE illuminant presented in different places with different sets of numerical labels on the Y axis! All of these tables and graphs are (so far) seen without any context, so I do not yet have any explanation of the scales. In any event, the best answer so far to your question is, "These graphs are only meant to present the SPD on a relative basis, so the units are arbitrary." But their nature (dimensionality) is "power per unit wavelength". Keeping in mind that I have not yet had breakfast, the matter of the units of the CIE SPD's for the various standard illuminants proves elusive. I do not have the definitive CIE document, and I don't plan to buy it (it is quite expensive - CHF 88, I think)). I do have what seem to be authentic transcriptions of the CIE definitions of a couple of those SPDs (which are in terms of a value for each 5 nm of wavelength). I might have thought that to normalize these SPDs the vertical scale would have been chosen to make the area under the curve (and thus the implied total power) constant, but that does not at all prove out for the examples I have. For example, if we consider the vertical axis unit to be the foobar, then for Standard Illuminant A the total area under the curve is about 48121 foobar-nm, while for Standard Illuminant D65 the total area under the curve is about 40972 foobar-nm. But those are in the same neighborhood, so perhaps there is only some subtlety of which I am yet unaware. 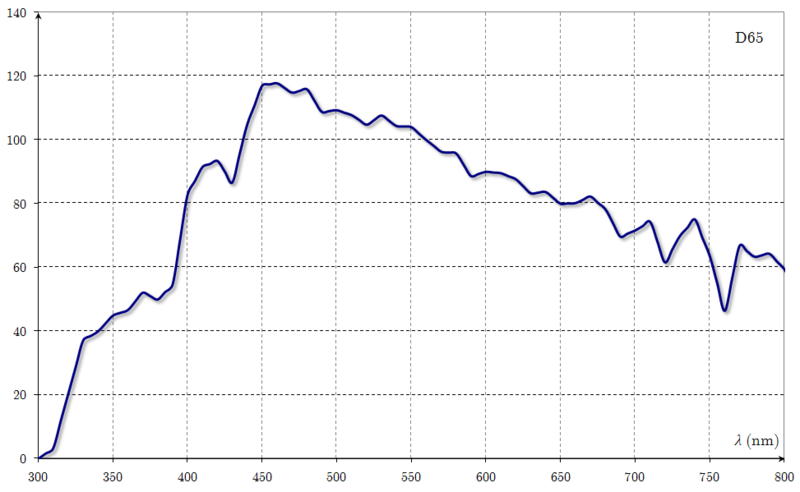 The vertical values of the SPD are indeed "relative", and are normalized so that the value at 560 nm is 100 units! So, the dimensionality of the vertical axis is power per unit wavelength, but the actual unit is chosen for each SPD so the value at 560 nm is 100 units. And I didn't even have breakfast yet (but it looms). But I had guessed it the first time I saw the PSD's for three of the standard illuminants plotted on the same chart! But it takes we dotards a while to catch on! Especially when yet unfueled. I take it that we all here are aware that "light" and radiometric power spectra are different beasts especially as regards "what the camera saw". That is to say that, as you know, a third spectrum is involved, the one that provides photo-metric measure. To a pedant like myself, "light" ends at about 730nm going up and at about 380nm going down. Slightly off-topic, but I was reminded of that when shooting "full spectrum" (actually about 300 - 1150nm) with a Sigma DSLR. Not having live view, the best recommended exposure mine could offer was that offered by the metering sensor, which is tuned to human vision and therefore recommended gross over-exposure, +2 EV or more depending on UV/IR reflectivity of the scene! 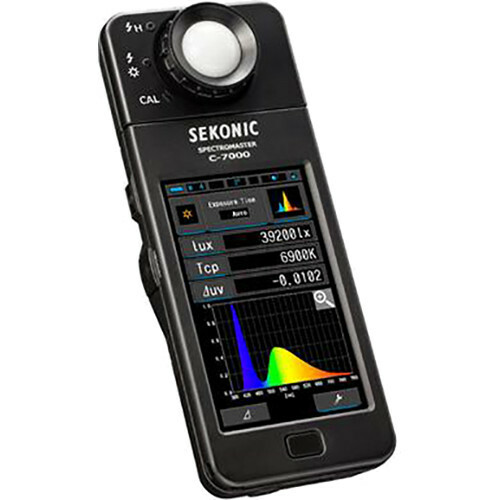 Quite interestingly the picture of the C-7000 shows the instrument measuring the output of typical solid state ("LED") lights: a strong blue peak with a broader "yellow" emission, and very little green or red. The reason is that these "LEDs" typically are a semi-conductor emitting blue light with a phosphor absorbing part of the blue re-emitting "yellow" light. The resulting combination appears "white" to the human eye. 3500K, quite a bit more power up in the red area and a lot less blue. Interesting Doug, especially for someone having at hand a spectrometer system which also handles color measuerements. Btw about LEDs, Nichia has some modern LEDs with three peaks, which delivers a close to 99% white high quality light. My friend asked me to do the spectral measurements for him, as he was designing / builfing a scientifc lighting system for bug photography. Well, your work gives you an interest in spectroscopy that goes beyond what most phtogrqphers need to consider! I'm not sure just what you mean by a "third spectrum". Perhaps you refer to the curve describing human "luminance" response to electromagnetic radiation as a function of wavelength (the luminosity function). This is then used to determine the "luminance" (or corresponding photometric measure) from the PSD of an instance of radiation (which is itself a radiometric measure). Indeed, only electromagnetic radiation with wavelengths in a range something like that is visible, and thus constitutes light, and thus has color. Slightly off-topic, but I was reminded of that when shooting "full spectrum" (actually about 300 - 1150nm) with a Sigma DSLR. Not having live view, the best recommended exposure mine could offer was that offered by the metering sensor, which is tuned to human vision . . .
. . . and therefore recommended gross over-exposure, +2 EV or more depending on UV/IR reflectivity of the scene! It’s a bit long, but the year just starts! Happy colored New Year to you all! It is important to note that we most often, when working with visible electromagnetic radiation, mention the wavelengths involved rather than the frequencies (even though the two have a simple direct relationship, one being the reciprocal of the other). And consistent with that, when we speak of the power spectral density (PSD) of an instance of radiation, it is customary, to be more thorough with its name, to plot the power spectral wavelength density function as the "spectrum" of the radiation. Thus the horizontal axis of our plot is wavelength, and the vertical axis is power per unit wavelength. But when we deal with radiation of lower frequencies (as in work on "radio"), we more often (today) mention the frequency of the radiation (although wavelength is indeed often of great interest). And consistent with that, in that regime, when we speak of the power spectral density (PSD) of an instance of radiation, it is customary, to be more thorough with its name, to plot the power spectral frequency density function as the "spectrum" of the radiation. Thus the horizontal axis of our plot is frequency, and the vertical axis is power per unit frequency. Now we might thank that, if we were asked to take the plot of the SPD of an instance of light and change it into the power spectral frequency density function form. We might think that what w need to do is to relabel the axes and perhaps do some sort of scaling of them, to suit the new units. But there is much more to it than that. For one thing, since frequency is the reciprocal of wavelength, for openers the horizontal axis is reversed between the wavelength spectrum and the frequency spectrum (I will use those short terms for conciseness). But also, as we move to the right on our frequency spectrum, a unit change in wavelength leads to greater and greater change in frequency. Thus, in a sense, the frequency spectrum plot is increasingly stretched to the right as we go further to the right. Now our vertical axis was originally in terms of power per unit wavelength, but is now in terms of power per unit frequency. But, again due to the "reciprocal" nature of wavelength and frequency, at the bottom end of our frequency "range" one unit of frequency may correspond to a certain number of units of wavelength, while at the top end of the frequency range, one unit of frequency will correspond to a lesser number of units of wavelength. The result of this is that as we go to the right on our frequency spectrum, the vertical height of the curve will decline compared to where it was at the corresponding spot on the wavelength spectrum. Now all this has little to do with our normal adventures in considering the matter of the "spectrum" of light. But those who also deal with the spectrum of radio signals (Will Thompson, for example) could be misdirected by the matter I discuss in this note. My apologies for not having illuminated this discussion with some illustrations. They are under preparation. Here are some graphs that should help illustrate the points that I made in my earlier note. Here we see the plot of the PSD (power spectral density) function of an illustrative (and wholly hypothetical) instance of an electrical signal, presented on a "wavelength" basis. We see that the SPD (wavelength basis) of this arbitrary, hypothetical signal is constant at 20 mw/m from 100-200 m, and at 30 mw/m from 200-300 m.
We now see that (as expected) the range of frequency within which the signal contains any power is 1000-3000 kHz (now stating the limits in normal order). The vertical axis now shows the PSD of the signal (on a frequency basis) denominated in mW/kHz. • We see that the PSD curve, which was flat in each region when using the wavelength basis, now declines over each region as the frequency increases. By the way, if we were to reckon the area under this curve, we would find that it of course also would indicate that the total power in the signal is 5000 mW. Looking at Shirley, the Ultimate Norm: Colour Balance, Image Technologies, and Cognitive Equity, by Lorna Roth, Concordia University. Abstract: Until recently, due to a light-skin bias embedded in colour film stock emulsions and digital camera design, the rendering of non-Caucasian skin tones was highly deficient and required the development of compensatory practices and technology improvements to redress its shortcomings. Using the emblematic “Shirley” norm reference card as a central metaphor reflecting the changing state of race relations/aesthetics, this essay analytically traces the colour adjustment processes in the industries of visual representation and identifies some prototypical changes in the field. The author contextualizes the history of these changes using three theoretical categories: the ‘technological unconscious’ (Vaccari, 1981), ‘dysconsciousness’ (King, 2001), and an original concept of ‘cognitive equity,’ which is proposed as an intelligent strategy for creating and promoting equity by inscribing a wider dynamic range of skin tones into image technologies, products, and emergent practices in the visual industries. Thanks for that reference (I haven't read the paper yet) and for that anecdote. One of the "dirty little secrets" of the NTSC broadcast video color encoding scheme is that the details of the I and Q chroma subchannels, with unequal bandwidth allocated to them, were in part predicated on the notion that, from a chromaticity standpoint, the most perceptually-critical task of the system was to reproduce with as much accuracy as possible, given the overall available bandwidth, the chromaticity of Caucasian skin, to which the viewers seen as relevant at the time were particularly sensitive. I'm not sure just what you mean by a "third spectrum". Perhaps you refer to the curve describing human "luminance" response to electromagnetic radiation as a function of wavelength (the luminosity function). Yes, Doug, that was it. The Luminous Efficacy curve. Sorry about the vaguity . . .
To show off to newcomers our longstanding and so helpful engineering “Mavin”, Doug Kerr! Look at selections of his writings here! It is really very nice and amazing to feel it. Thanks for sharing this content.